The modern architecture of Almere begins in 1976 when the first houses are built for the workers who will reclaim the land from the old Zuiderzee or Southern Sea. Today this sea is called the IJsselmeer. Forty years later and the construction continues and Almere has been transformed from a seabed into a city of more than 250,000 people. Being a planned city that is only 40 years old has advantages. One is that you can invite world famous architects to your new city, give them some space and say have at it. So in addition to planned housing that makes up 50% of Almere’s housing market, you have unique private homes, several modern buildings, and two experimental neighborhoods named de Fantasie and de Realitie. 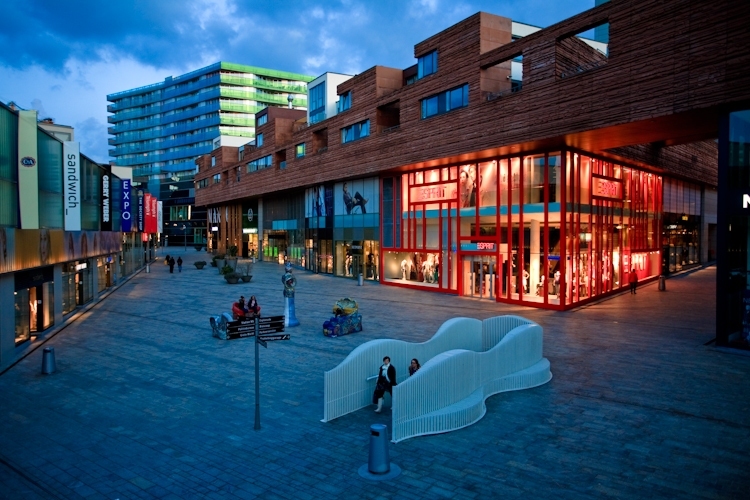 The center of Almere was designed by Rem Koolhaas and Office for Metropolitan Architecture. Koolhaas saw the city center in two halves, the underworld for cars, and the upper world for people. Almere is extremely friendly towards every type of transport. From walking, to biking, to driving, to public transport, each form of transportation has its own lanes and networks of paths that protect it from other paths. Since the law in Netherlands is extremely simple, pedestrian has right of way over bike, and bikes have right of way over cars, any crossings are always yielded to the slowest form of traffic. The Citadel, designed by French architect Christian de Portzamparc is 100 square meters divided into four quadrants. Underneath is the parking garages for cars. Above the car parks are 50 shops, and above the shops are 46 houses in all sorts of colors as well as a small apartment complex. A great view of the Citadel can be had from the terrace of La Place restaurant on the top floor of the V&D warehouse. The Smaragd, or Emerald, is another example of this multi tiered approach. Designed by Gigon & Guyer it is anchored by department store Hema and has apartments above. Rem Koolhaas also design Utopolis, the ultra modern movie theater complex. Blok 5, or the Lake Side apartment building is another unique building designed by Search BV. Almere’s skyline is framed against the background of the Weerwater. It is here you will find five of the most admired and visited examples of modern architecture in Almere Stad. Next to the theatre are two apartment tower set in an L shape called ‘Side by Side’. Designed by Frits van Dongen Side by Side contains 144 apartments. Two things set the towers apart; their height and the blue colored facade. Over 20 unique types of units exist inside as evidenced by the variety of different window frames seen from the exterior. The residents can enjoy a garden, a sauna and a gym within the confines of the tower as well as a pool overlooking the Weerwater. Side by Side has a bit of a mysterious and embarrassing history in that the L shape made by the two towers came by way of accident. The towers were originally meant to be parallel to each other and the original model accurately reflected that. Well it did up until the point that someone bumped into it and in a bit of Seinfeld inspired humor, put it back together perfectly with the exceptions of turning one building 90 degrees! The clumsy architectural savant was never identified and van Dongen is hailed as a genius. On Espladnade, which is the large square on the edge of the water lies Schouwburg Theater. Opened in 2007 by Queen Beatrix its minimalist design and facades were at the center of its charm. Its transparent natures leads to spectacular lighting while its simplistic stylings take your breath away. Three theater halls stretch out into the Weerwater ranging from a cozy 150 seat space to a grand 1000 seat hall. Not only does it serve as a majestic theater but it also promotes the arts by offering a wide variety of courses in music, theater, literature, dance, and design. Blok 16 is a pretty cool name for a place to live so it really didn’t need another name. 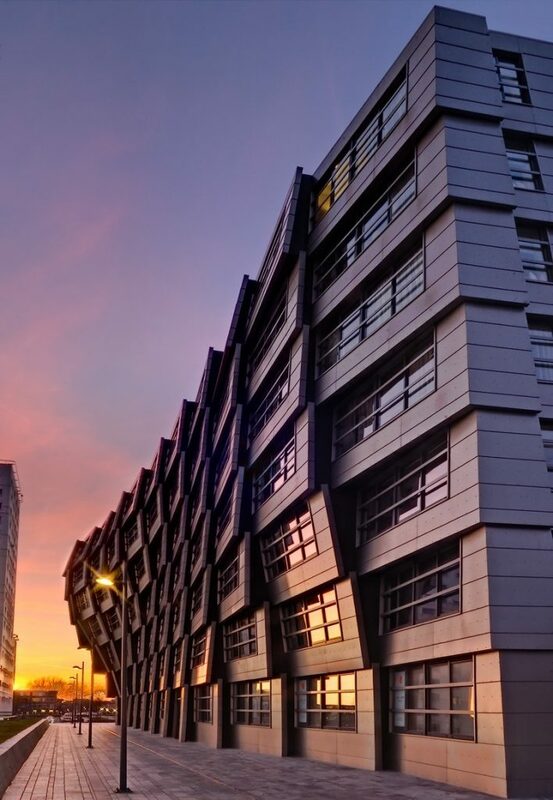 But for reasons that are readily apparent with one look at its facade, the aluminum plated, 7 story apartment building ended up being called the Wave. Forty two apartments make up The Wave and designer Rene Zuuk also designed the accompanying white bridge for pedestrians and bikes. The leaning tower of Almere is known as Silverline. Designed by Claus and Kaan the top of this apartment building appears to lean over the Weerwater. Believe it or not this wasn’t done for design reasons but due to psychology. It seems human beings prefer to live at the top or the bottom of building. Being in the middle is considered the least desirable place to be. The solution? Make the ground floors and top floors bigger than the middle floors of course! This dumbell shape lends itself to the optical illusion of the building leaning out over the water. The vertical ribs of aluminum used as cladding are the inspiration for the name. Urban Entertainment Center was designed by British architect William Alsop. Perched above a car park designed by Rem Koolhaas, it includes Mediamarkt with its colorful facade, the Apollo Hotel and Muzinq. At the bottom, adjacent to the car park, a small pond is situated in a square called Schipperplein. When the water of the pond freezes in winter, people come to skate on it. ‘Muzinq’ is a sprawling concert center with three halls, one holding over 1000 people. The Apollo Hotel Almere opened in 2008 and has 117 rooms. Floating 25 feet above street level, 4000 square meters of hotel rooms seem suspended above traffic beneath a cedar facade supported by columns. La Defense is a building you need to see during daylight hours. Outside of business hours the gates are closed which bars access to the inner courtyard which is a must see. La Defense utilizes the familiar aluminum facade but mixes it with glass covered in reflective foil. 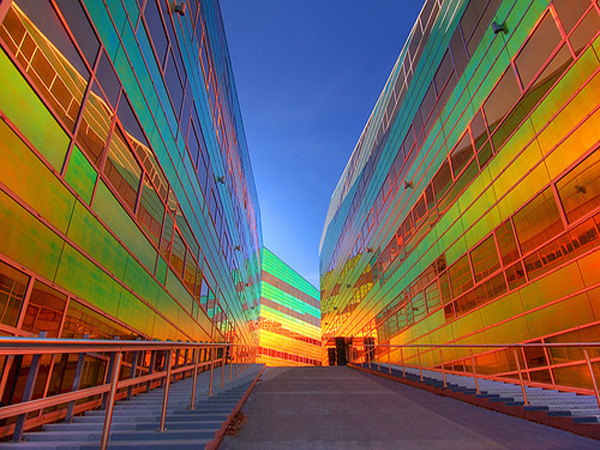 When sunlight hits the building the color of the facade will vary with each step shifting through a spectrum of color. Designed by Ben van Burkel, who also designed the Erasmus Bridge in Rotterdam, La Defense is the most photographed building in Almere. In Almere Stad, in Stadhuisplein you will find de nieuwe Bibliotheek. This new library is one of the crown jewels of the Netherlands library system. In 2010 it not only won awards for its interior and exterior design, but also was named library of the year in all the Netherlands. It is much more than a library offering classes, having a cafe, entertaining children, selling books, and promoting the arts in Almere. From an architectural standpoint, both its exterior and interior are extremely modern, yet utilitarian. The dutch have an ability to design such that form does not sacrifice function. In fact, it is more likely that the form of the building in some ways contributes to the function of a building by means of creation of clean energy through solar panels or using sunlight and windows to minimize energy costs. Back in 1982 a foundation called De Fantasie, the Dutch word for Imagination, held a contest. The contest asked for designs for a dream house, one that would fulfill the owner’s personal wants and desires. From the nearly 150 entries, 10 winners were chosen to build houses that would last 5 years. Each was give 450 square meters to build the house of their dreams. Visitors flocked to see the cluster of unusual and unique homes. As a result de Fantasie became a beloved landmark and the houses are still there. As an added bonus, many of the builders still live in their houses that have now stood the test of time for over 30 years. Since the de Fantasie neighborhood was an unparalleled success, in 1985 de Fantasie the foundation struck again. This time the contest was to construct temporary houses in Noorderplassen on the shores of a lake. Nearly 200 entries produced 17 winners. Again the public came to see the houses and the houses have survived to this day. Unlike de Fantasie houses, de Realitie houses are much smaller and do not have the necessities to be lived in full time. However they still get use in the summer by their owners as holiday bungalows, and the public still comes to see their imaginative structures. Next to the Eilandenbuurt (Islands Neighborhood) in Almere is the Regenboogbuurt (Rainbow Neighborhood. Onkel Toms Hütte, designed by German architect Bruno Taut in Berlin’s Zehlendorf served as inspiration for this colorful collection of houses. Even street names get into the act. On Chamoisstraat, you’ll find the yellow tower houses by Wickham Van Eyck Architects. Liesbeth van der Pol designed Klein India (Little India). It consists of 72 houses, a garden and a pond. She also designed three red colored high-rise flats, called the Rooie Donders found along Pastelstraat. Their form is an homage to the grain silos that once stood there. Entire neighbourhoods were designed and built, namely the Muziekwijk neighbourhood (1990) and the Filmwijk neighbourhood (1992) in the centre of Almere, and more recently the Eilandenbuurt (Islands neighbourhood) (2001) in the outskirts of Almere. The Pakhuizen (Storehouses) on the Bonairepier look the same on the outside, but the interior parts of these houses could be uniquely designed by each resident. Almere Poort is the newest district of Almere and still developing. Almere Poort currently includes the Europakwartier (Europe Quarter), Homeruskwartier (Homer Quarter), Olympiakwartier (Olympia Quarter) and Columbuskwartier (Columbus Quarter). Each quarter has its own character. For example, in the Columbus Quarter the main focus is on sustainability. There you’ll find streets with houses standardly equipped with solar panels on top, which offers a unique appearance. In Almere Poort you will find a wide variety of homes, also because there is plenty of room for people who wish to personally shape, or even build, their new home. In some streets in Almere Poort, every single house is different. In parallel with the development of the various quarters all necessary social facilities have been built, such as schools, a medical centre, shops, bus stops and train station Almere Poort. 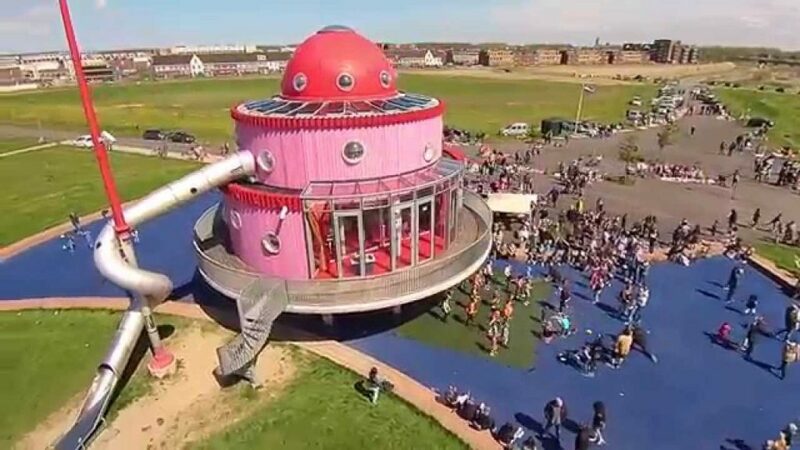 In addition, there are some special buildings to be found, such as the Topsportcentrum Almere (arena) and KindercASLa, which has the shape of a pink cake and which was designed by a child. The bright orange Overgooi Villa, also called Villa of Five, in the district Overgooi (located directly behind the dike ‘Gooimeerdijk-Oost’) attracts a lot of attention. This villa was designed by NEXT Architects, commissioned by a collective of five individual residents. Thus, the villa consists of five different homes. In 2008, the Villa of Five was nominated for the Golden Pyramid, the state prize for inspirational commissions. In the vast district called ‘Tussen de Vaarten’, there are some notable houses as well. For example, the ‘geluidswalwoningen’ (noise barrier houses) by Tangram Architects and a green chain of apartments along the Hoge Vaart canal (in the Renoirstraat) called ‘TWOFACE’ by NIO architects. Finally, the pyramid-shaped houses at the waterfront in the Victoria Regiastraat (in the Bloemenbuurt – Flower Neighbourhood – in the outskirts of Almere) are admired by many people as well. Next to the A6 motorway, exit ‘Almere Stad’, there’s a controversial building called the Brandboxx (but understandably nicknamed UFO). This silvery textiles/fashion centre is both admired and detested. Another distinctive building is the ACTA/PABO (Teacher training college) in the city centre, designed by architect Frank van Waes. This building stands out by its red colour and glass facade. In the Filmwijk neighbourhood you’ll find the purple coloured Medical Centre (Gezondheidscentrum), designed by Aldo and Hannie van Eyck. In 2009 the Oostvaardersplassen Information Centre, called ‘De Oostvaarders’, was opened; it is located in the outskirts of Almere, along a splendid wildlife area, called the Oostvaardersplassen. The building was designed by Drost + van Veen architecten bv, and houses an information centre, restaurant, classroom, observation post (on the first floor) and a meeting room. It had to be built quickly, in order not to disturb the wildlife in this area. 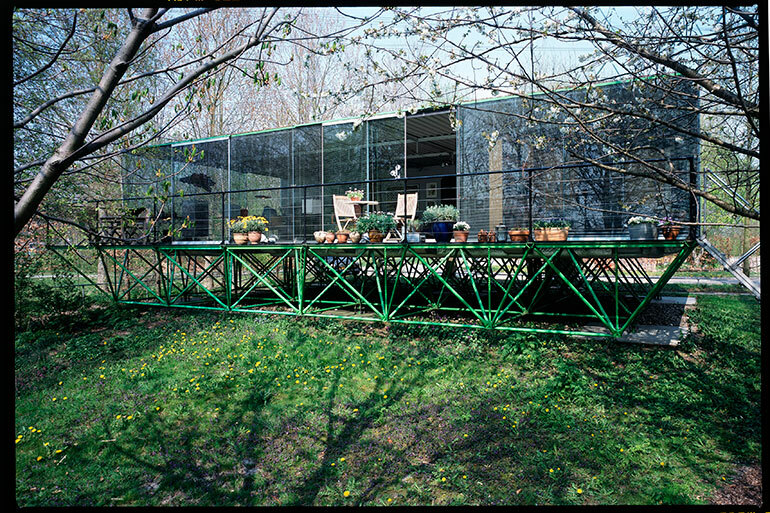 Therefore, prefabricated solid-wood walls and floors were used. An impressive number of striking houses and other buildings have been built in Almere’s newest district, named Almere Poort. On the outskirts of Almere Poort, near the Oostvaardersdijk, is the bright red Heat Transfer Station (Warmte Overdracht Station) (2012) of energy supplier Nuon. Very hot water, transported from Diemen through an eight-kilometer long pipeline in Lake IJmeer, is transferred in this Heat Transfer Station into large part of Almere’s heating network. One side of the building consists mainly of glass and provides an industrial-looking insight. At the Evenaar (literally meaning: Equator), one of the main roads in Almere Buiten, several notable buildings are being built at the moment, including the Van Hanh Pagode (a Vietnamese Buddhist pagoda) and a mosque.